Actor Eddie Redmayne took home the "Best Actor" award at the 2015 Oscars for his role as Stephen Hawking in "The Theory of Everything." Famed British astrophysicist Stephen Hawking took to Facebook last night to congratulate actor Eddie Redmayne for winning the best actor Oscar at the 2015 Academy Awards for "The Theory of Everything," a biopic about Hawking's life and his debilitating illness. "Well done Eddie, I'm very proud of you," Hawking wrote on the social network after yesterday's ceremony (Feb. 23). Hawking had previously congratulated Redmayne on winning a Golden Globe award for the role. 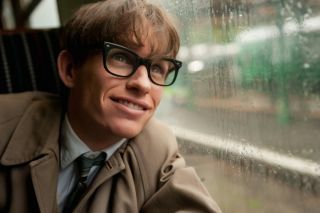 Of Redmayne's portrayal of him, Hawking wrote, "At times, I thought he was me." Redmayne brilliantly captures Hawking's transition from a vivacious young man racing around on bikes to needing a cane, then two canes, and eventually being confined to a wheelchair. The actor told Live Science previously that he worked with dance choreographers and patients at an ALS clinic to get the physical poses just right. He also worked with a speech therapist to recreate Hawking's progressively garbled speech. In addition to Redmayne's best actor honor, the film was nominated for best picture, best actress, best original score and best adapted screenplay. "The Theory of Everything" was based on the memoir "Traveling to Infinity: My Life with Stephen" (Alma Books, 2013), written by Jane Hawking, Stephen's first wife. But "The Theory of Everything" wasn't the only film about neurological disease honored at the Oscars this year. Julianne Moore won the best actress award for her portrayal of a woman suffering from Alzheimer's disease in the movie "Still Alice." And themes of neurological disorders or mental illness have had their share of awards and nominations in previous years. In 2013, Bradley Cooper was nominated for best actor for playing a man suffering from bipolar disorder in "Silver Linings Playbook." Jennifer Lawrence won best actress that year for depicting an emotionally unstable young widow in the same film. In 1997, Jack Nicholson won best actor for his role as a misanthropic novelist with an obsessive-compulsive disorder in "As Good As It Gets." And in 1988, Dustin Hoffman took home the top acting award for portraying an autistic savant in "Rain Man," a character based in part on real-life savant Kim Peek.